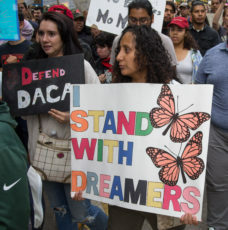 we speak with Jodi Jacobson about the current status of the Deferred Action for Childhood Arrivals Program and Democrats inability to pass a resolution on DACA. Later we speak with the hip hop group Alphabet Rockers about their new cd and Grammy nomination for Best Children’s Album. Jodi Jacobson, the president and editor in chief for Rewire News. Kaitlin McGaw, lead Alphabet Rocker. Alphabet Rockers use hip hop to shift the way people see themselves and each other – it’s music that makes change. Tommy Shepherd, lead Alphabet Rocker.